In the sitting (I do it in the sitting) or standing position, tilt your head back the way you see me doing it in the photo. While tilting your head back, press your tongue firmly into the roof of your mouth. This tightens up all the muscles at the front of your neck and under the chin. Now bring your chin down toward your neck while still holding the tongue against the roof of your mouth. That's all there is to it. If you are doing it right, you will feel a tightness under the chin and in the front of the neck. Check this out with your fingers. Does your platysma muscle feel tense while you are moving your head up and down? If it does, you are doing the exercise right. The following video of the same material is for those who speak Spanish - para las personas que habla español. Cervicoplasty is a surgical procedure that removes excess or loose skin from the front of the neck. It involves a small incision below the chin and perhaps behind the ears. The excess skin is then neatly trimmed and tightened up. The results of this simple procedure can last over ten years, at which point a touch up may be needed. During the surgery excess fat may also be removed with a suction device - liposuction. All this will sharpen up the chin and jawline, taking years off a person's appearance. The recovery time for these procedures in usually less than two weeks, and there is only a small chance for complications like infection or scarring. I've never had any cosmetic surgery, but if I had a turkey wattle loosely hanging down from my throat, I certainly would make an appointment with a competent surgeon. I would check on the surgeon's credentials and find out the price before I signed any forms though. The neck is a sensitive structure with delicate nerve attachments that can be harmed by vigorous exercises. The one that I describe here will give you no problems but some exercises might. For example, some exercise gurus recommend an exercise for the neck in which you lie on a bench or bed with your head hanging over the edge. Now you raise and lower the head. This is an excellent exercise for the front of the neck - the sternocleidomastoid muscle and the platysma - but this exercise has the potential of giving you an acute and long-lasting "pain in the neck." Be extremely careful with any neck exercise. It is uncomfortable to have pain radiating down into your upper back and shoulders. If you do the exercise I show on this page, you'll get excellent results without any adverse effects. It's a gentle exercise. When you lose weight fast, it often takes a lot of time for the skin of the neck to shrink back to where it matches your new scaled-down body. Maybe it never will shrink back if you're on the far side fifty. The neck and the belly are probably the first places you gain weight. These are also the last places where you will lose weight. And when you do lose weight around the neck, there is sometimes what's called platysmal banding. These are the ugly vertical bands you see at the front of the neck. It's hard to get rid of these. Necklace bands are the horizontal lines that form in the front of the neck - also hard to get rid of, but not impossible . This woman would look good if she did not have that excess adipose tissue under the chin. The double chin is caused by a layer of fat under the chin. Fat people and old people often have this unwanted layer of fat. They might also have a lack of tone in the bands of muscle at the front and sides of the neck. Of course a few young people have the double chin too. In them the problem is caused by genetics: looseness of the neck skin, bad bone structure, and fatty build-up. The last time I saw my dermatologist, I saw two large posters in the waiting room with before-and-after photos of people who used Kybella. The people in the "after" photos looked better. Kybella is an FDA-approved drug that is supposed to remove submental fat - the fat responsible for the double chin. It's a nonsurgical alternative to more invasive procedures like the neck lift. Kybella is injected into the area where this submental fat accumulates. The chemical destroys the cell membrane of the fat cells. Blood then circulates through the double chin area clearing out the fatty deposits that no longer have the cell membranes to keep them in place. The Kybella treatment has occasional adverse side effects - nerve damage in the neck, skin problems at the injection site, and swallowing problems. But these are rare if the drug is administered by a doctor who has had training in the administration of Kybella. Kybella is injected into the problem area in four to six sessions separated by about four months. In each session around 50 injections are given. 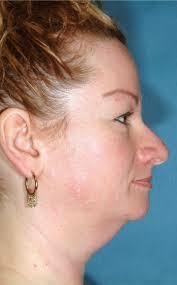 The reduction of the double chin can last for up to four years. The cost for the procedure is usually in the $3000 range. It's not covered by insurance.